If you need a fence for a limited period of time, temporary fencing is the ideal solution for your fencing needs. Temporary fences can be installed into the ground or braced by temporary supports that can easily be removed when there is no longer a need for fencing. Learn more about temporary fencing in Richmond and the situations in which it can be used in our blog. Temporary fencing is required at construction sites to protect both those on the job and passers-by. There are a number of temporary fencing options for construction sites, from in-ground chain link to jersey barriers with slat inserts to temporary fencing with windscreens. Temporary fencing is also necessary for crowd control at large events. From concerts to campaign rallies, turnkey temporary fencing solutions are available to maintain crowd control at large events. Temporary fencing can serve as an effective theft deterrence strategy. For example, on construction sites, equipment and materials can be protected from thieves with 8′ high fencing. 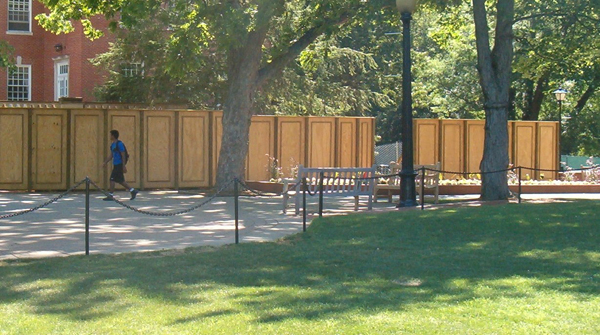 Temporary fencing can provide walking corridors and direct foot traffic in order to promote public safety. For storage of large objects outdoors, temporary fencing offers an effective solution until the objects can be transported to another location. Temporary fencing offers an ideal solution for fencing needs that are not permanent. From construction sites to outdoor concerts to public safety to threat deterrence we can provide you with a turnkey solution that fits your needs. Are you interested in learning more about temporary fencing in Richmond? We can help you choose the right fence for your needs. Hercules Fence of Richmond has been providing professional fence installation and service in Richmond for more than 50 years. Call us at (804)752-7992 or contact us on our website to learn more about residential and commercial fencing in Richmond. This entry was posted on Friday, January 23rd, 2015 at 3:38 pm. Both comments and pings are currently closed.